Half - this is a powerful success principle as we reduce our expenses and consumption and in turn increase our levels of unspent money. Use half as much shampoo and see what happens. Then try half as much again until a minimal viable amount is reached. Halve the amount of laundry liquid you use - see what happens. Again aim for a minimal viable amount that works for you. Use half the amount of meat as normal. Replace meat-based protein with an egg instead. Half the amount of loo paper you reel off in one go - count the sheets till you arrive at a minimal viable amount instead of a massive scrunched wad. Observe what get scrapped off dinner plates after a meal and halve or eliminate those food that regularly get wasted. Halve plastic container usage - save and reuse glass jars instead. Time your showers for a week, then the week after, shower for half as long. Halve the amount of required time for deadlines at work and watch your productivity rise. Make emails half as long. Halve the amount of water you put in the kettle - in fact, only put exactly the amount you need (as long as it covers the element). A cuppa boils far quicker this way. Finding minimal viable amounts is key to successfully halving. Keep halving till the amount no longer does its job, then back it up a notch to a minimal viable amount that works just fine. The list above are just examples - I'm sure you will have far more relevant ones for your circumstances. Take care and stay nice. I struggle to put less on my plate - even as I'm dishing up, I KNOW I cannot eat much... However, I never feel obligated to eat more than I want as there are always 3 pairs of beautiful eyes watching for whose turn it is to clean up after me. You could try using a smaller plate. That helps to make it seem like you have a plate full, when you are really dishing up less. We have done this with both bowls and plates, with a good reduction of food waste. Phil what a great subject and you are right that using less of everything works and saves money. We use many of the suggestions you have above and find using half our laundry liquid int he wash works just as well as the full amount. - is to half fill the kitchen sink (a large butler style stainless steel one here) with water when washing the dishes instead of fully filling it saving on tank water use. - Use the grey water from our washing machine to water ornamental shrubs and trees around the property rather than using town water that is connected in our yard further saving on expenses. We also use grey water pumped out of our grey water tank to water fruit trees and the lawns instead of using town water. We are currently in drought and on water restrictions here. This is a very useful list of tips, Phil. Love this Phil, some great suggestions there that I will certainly think about as I know I am sometimes over generous in some of the products I use. I have a toilet roll habit, I count how many squares I use, everytime. As for shampo ect, I have purchased plunger tops for each bottle, one press is enough. For years I use a smaller plate for my meals, as the plate in our set are huge, and it's so easy to fill a plate, which for me always means I eat it all. My mum always made us eat everything on our plate, so now I can't stand waste. I follow most of those suggestions and have been for years. Screen time seems to be the one that is hardest to cut. Deb, I can relate to your comment on screen time. I decided to rate everything I watched out of ten. If it didn't consistently average at least an eight, I cut it out. This really helped me as I also rated my hobbies, gardening etc and those always came out at eight or above. It made me realise that most of my screen time was because I was too tired to do anything else! So now I try to have a sleep instead of wasting time vegetating. 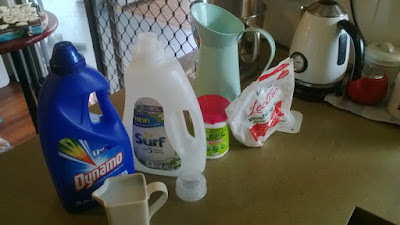 I am going to try and remember to top up our dishwashing liquid and liquid hand soap with water. Thanks. Dish detergent can be diluted by quite a bit more than a half and still be very effective. Shampoo and conditioner are not necessary at all. Water does the job very well. Appreciate the emails, half as long suggestion. I try this with blog posts, or anything I write! Remove words, but still convey the same message. Just deleted, "Where can I" from the former sentence, lol. I had to laugh at 'talk half as much' - this is certainly advice I should take! Great reminders, Phil, all the savings really do add up and it's easy to be a bit complacent when times are good. Damn I missed this post earlier. Love this concept! As you know I'm a big fan of incremental savings, and this is a great illustration. Too true Dave. It is the accumulation of small matters that give some of the best results.